Showcase your ID cards with a bold, sturdy lanyard and swivel hook. 3/8" cordage offers thick, durable attachment. 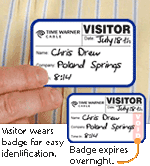 • Non-breakaway lanyard offers sturdy badge holding for offices and events. 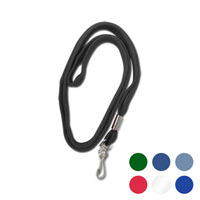 • Swivel hook keeps your badge flat and visible. • 3/8" cord is great for long-term use and durability. This product can expose you to Antimony Trioxide, which is known to the State of California to cause cancer. For more information go to www.P65Warnings.ca.gov.